Toss the toss-away guilt with reusable cloth paper towels. 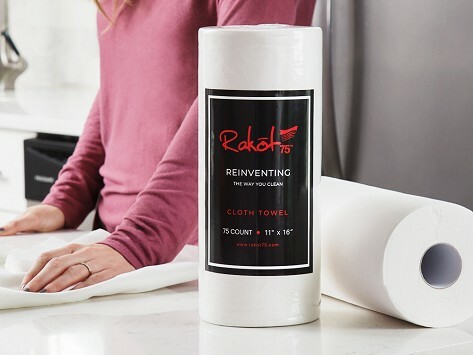 The roll might look like the typical household helper, but its tear-resistant and lint-free cloths are durable and washable so you can use one over and over. A roll can last up to about six months of wet or dry jobs, depending on what you use it for. Sheet size: 11" x 16"
or cleans it up.... Soft enough to clean your monitor yet durable enough to use on a car engine or to wipe down the dirtiest of dirty. Just rinse it out and it's like you never used it in the first place. I bought a roll about 6 months ago and am only about 1/2 way through it. It's like magic, I tell you - magic. I used to go through about $40-$60 worth of paper towels in the time it's taken me to use less than half a roll, so it's also saving me tons of cash. Great idea and paper saver! This product is fabulous. I use it to clean the sinks and kitchen tops. It saves me wash cloths and paper towels. Reusable and hardy. Great product. Rakot75 Makers Gary and Kathy Weltman have over 30 years of experience working with industrial textiles. They created cloth paper towels when they learned their employees were using the fabric off-cuts at home for cleaning. The reusable cloths are like a tougher, harder-working, and longer-lasting paper towel. They're washable, tear-resistant, and lint-free. Sure, they tackle the usual household clean-up duties, but what's impressive is all the other ways these cloths can lend a hand. From the common tasks—think wiping and dusting—to the out-of-the-box, like using one as a napkin or a makeup remover. A roll of cloths can last up to six months, depending on what you use them for. So the question is, what will you use them for?